Hey, I have been having a problem with builds failing in Visual Studio 2015 Community Edition the second time I build them. I am able to build once without getting this error, but when I make any changes (even if its just deleting white space) I get this Failed Build error as you an see below. This happens with any project I attempt to build, old or new. update: I can build the C++ Code if Unreal Editor isn't open and I don't get the error. The second I open the Project in Unreal Editor and try to build in VS2015 Community I get that error in Visual Studio. Tried reinstalling both Visual Studio and unreal Engine 4.15.0 on the same drive , it did not fix the issue but is now giving me even worse issues by not allowing me to open the solution when making a brand new project. I'm facing the same issue. I need to rebuild each time which takes way too long. This never happened on a similar setup on the previous version of the engine. It seems I have found a "Work Around" for this issue however it does cause another issue which I have yet to get fixed. Create New Solution Platforms Checked. Select x64 for UE4 and this should fix the issue. I am now however having an issue with the Hot Reload feature of Unreal where it has complacently stopped working and I've yet to find a solution that sticks. Compiling the code from within the UE4 editor instead of VS works for me at the moment. Would still like to know why the error occurs when building through VS though. I spent almost half day to search for the solution to this.Finally, I found something useful. You can refer these two links above. Both the same, either one will be fine. 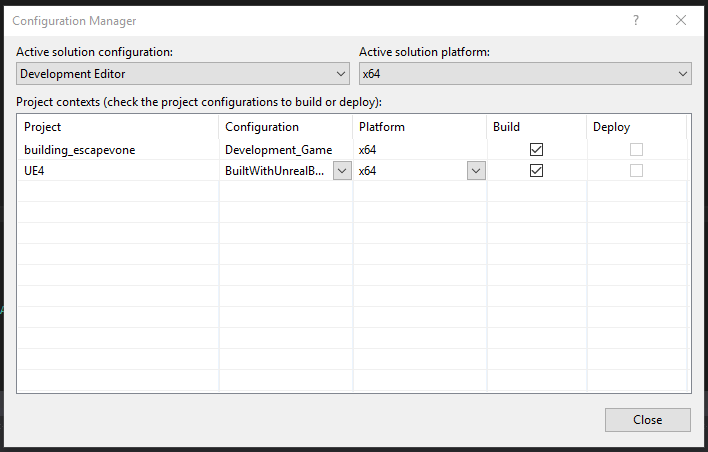 Add GameplayTasks to PublicDependencyModuleNames of the YourProjectName.Build.cs file~.